London studio David Kohn Architects has created an arts venue in a former sweet factory on the edge of the Olympic Park. 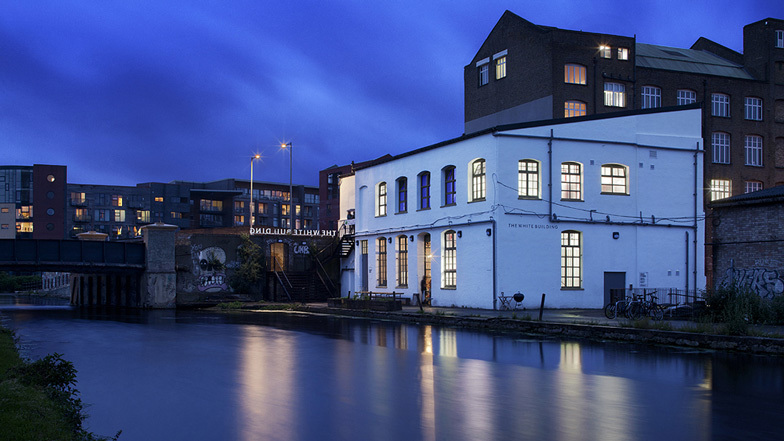 The White Building is situated amongst a community of artists on Fish Island in Hackney Wick and accommodates a gallery, an events space, a cafe and a series of artists' studios. Lambswool hangs in nets to cover the underside of an existing asbestos roof that is supported by red steel trusses. Five new entrances lead into the building, allowing the different rooms to be used in flexible configurations. The project is one of a number of "Olympic Fringe" projects instigated by Design for London for sites bordering the Olympic park. Others include public realm improvements by architects Muf and the London Pleasure Gardens. ‘The White Building’ is a new cultural venue in Hackney Wick commissioned by the London Legacy Development Corporation. Situated across the Lea Navigation Channel from the Olympic site, the project overlooks the Olympic stadium. The refurbished building, a former print works and previously a sweet factory, will house artists’ studios, a gallery, hire space, café and micro-brewery. The project was won through invited competition by David Kohn Architects in collaboration with Michael Pawlyn of Exploration Architecture, specialists in environmentally sustainable design. The competition was organised by Design for London, part of the Greater London Authority, as part of the ‘Olympic Fringe’ a string of small-scale projects aimed at stitching the Olympic Park into the surrounding city fabric. Hackney Wick Fish Island, a former industrial area, is currently celebrated for being home to the highest concentration of artists studios in Europe. 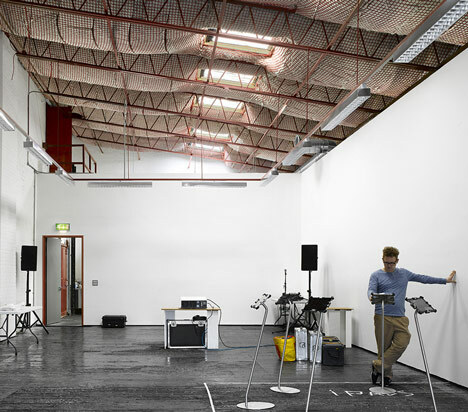 The end user is Space Studios who contributed to the project brief to create a cultural venue in Hackney Wick that would serve the existing community as well as provide a public face to visitors. Space Studios is a charity that has been providing platforms for artists since 1968. » show a past and future London at the Olympics. The eventual built project used local businesses extensively for supplying materials and skills from glazing to sign-painting, steelwork to joinery. The project was delivered on time and budget. New interventions complimented the existing building fabric, such as blockwork walls on the ground floor that incorporated steel-framed windows. The ground floor was opened up to the canalside and Queen’s Yard to create a light-filled interior with the feel of an urban courtyard. On the first floor, existing red-painted steel trusses supported an asbestos sheet roof with no insulation. In order to improve the environmental performance of the building and the appearance of the interiors without interfering with the asbestos, lambswool was suspended in red string nets to create soft vaults between the trusses. Throughout, there was a design approach that sought to use conventional construction materials, but in a playful way. Material junctions were detailed in such a way as to give even the most industrial construction a lightness of touch. Five new entrances were created that allow the building to be used in a variety of different configurations. The ground floor houses a café, pizzeria, microbrewery and group studio space. The first floor offers four artists’ studios, a gallery and hire space overlooking the Olympic stadium. External works included wide steps from street level down to the canalside. Space Studios currently have a ten year lease on the property. The hope is that during that time, The White Building can become a significant local asset, well-used by the creative community and public alike. If it proves to be successful, then the project could become key to the retention of cultural activities in the area during future urban change and development.